Right now only about half of my stash is in the studio, and only about a tenth of it is readily visible. And yet, I found inspiration in those few pieces! I started out with these two pieces that I had bought recently. I do love the color and the patterns on these. 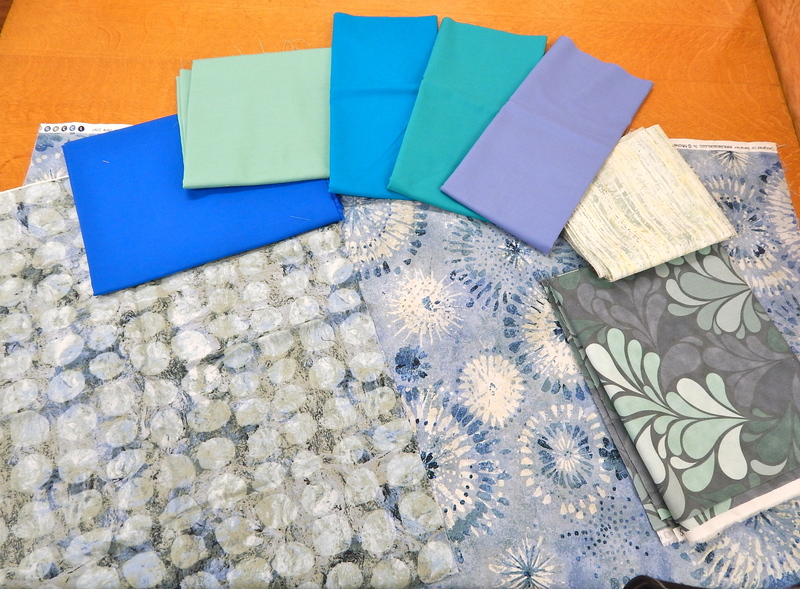 And then I started trying to find fabrics that would go with them. I was looking for a “color wash” effect. Nope, one’s too bright, and one’s too dark. 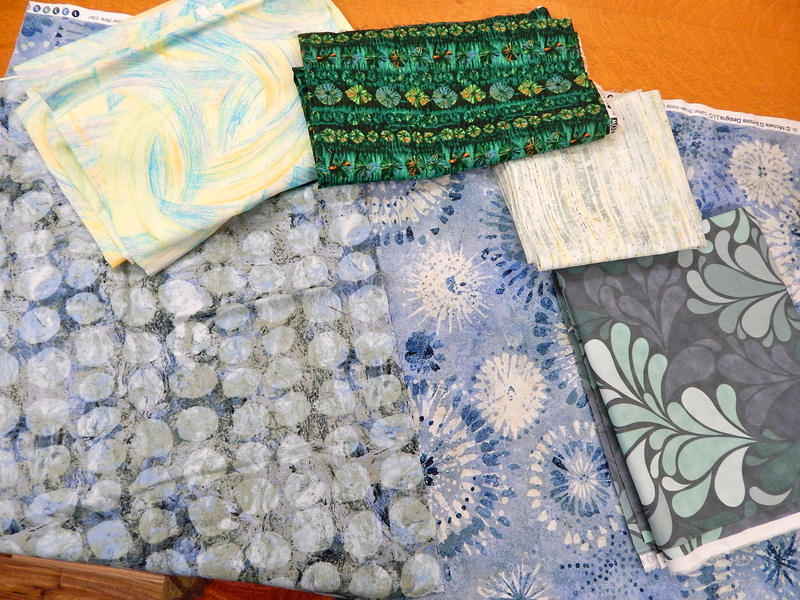 That pale one might work, and for sure I like the gray/blue paisley. Trying more solids. Nope. Give it up. You’re going to have to take a trip out to the storage shed. Oh, but before I go out there, I auditioned the contrast colors that I had spied in the studio–oh yeah, those are going to work great! 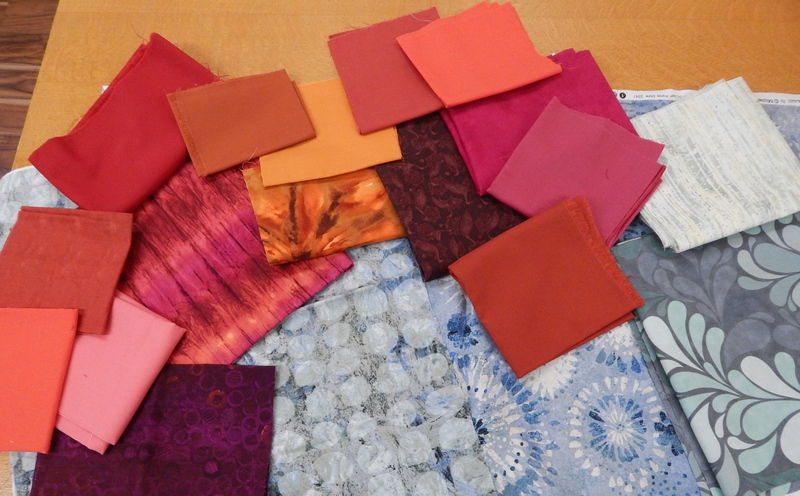 Trying out more mostly solids in that red/magenta/coral/orange color way. 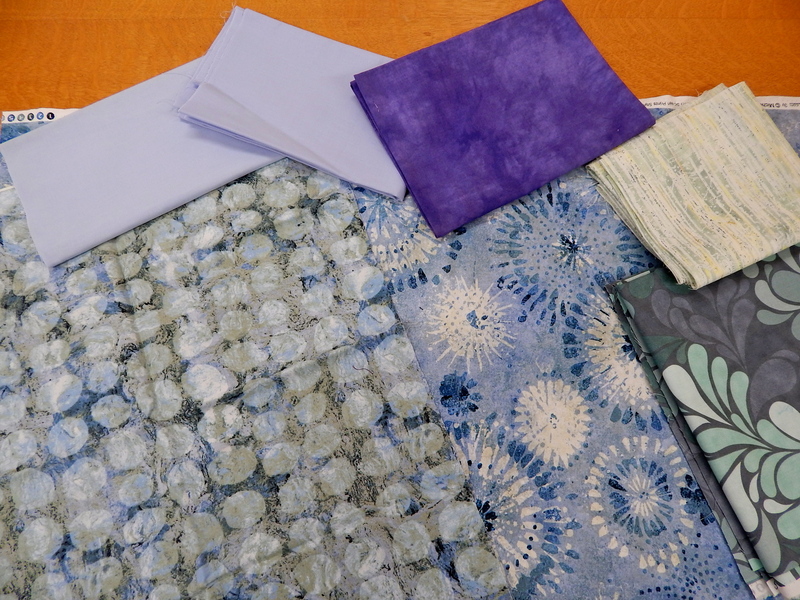 These pieces could be solid colors, because they would have the kantha stitching on them, and I don’t want too much pattern to distract from the stitching. Alright, out to the storage shed, where I picked through my blue and red/orange/pink tubs to see what I could find. I found quite a bit! 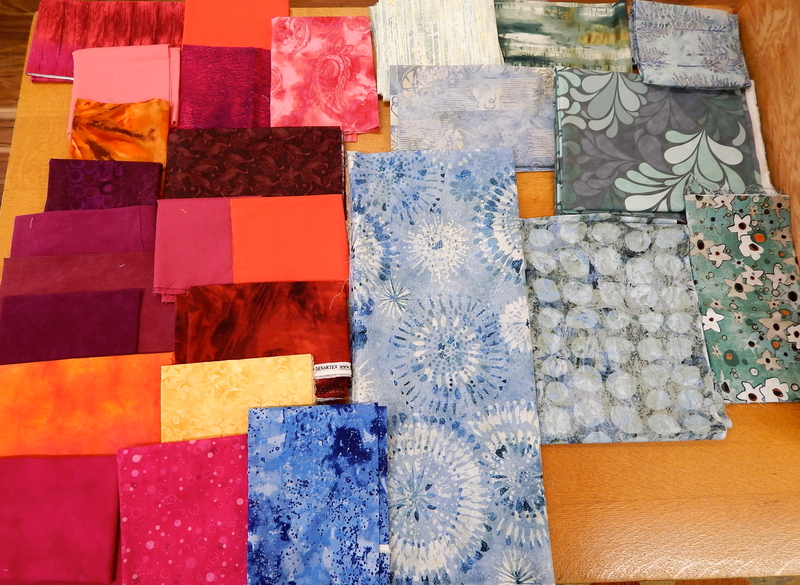 And then narrowed my choices down, and laid them out neatly so I could keep walking by and looking at them. 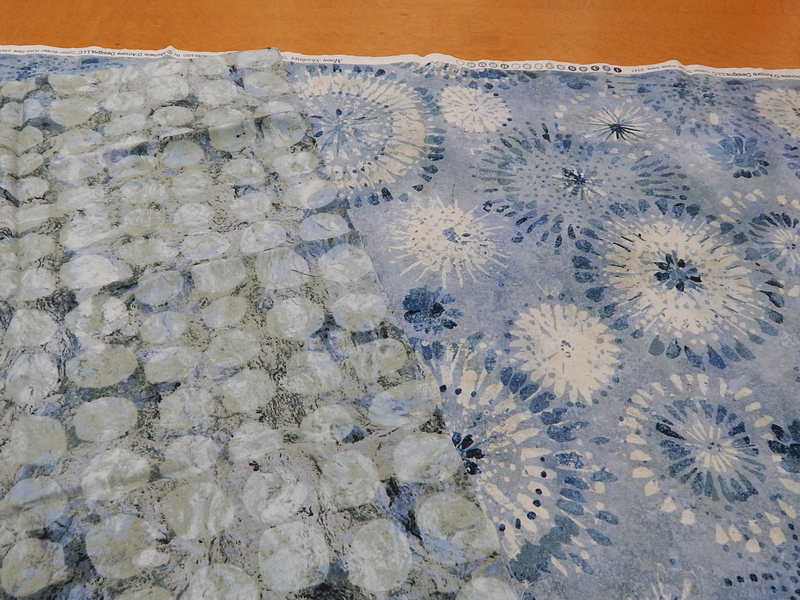 Sometimes I am stubborn, and leave in a fabric that I love, even though it seems to stick out (like that dark bright blue in the middle front.) 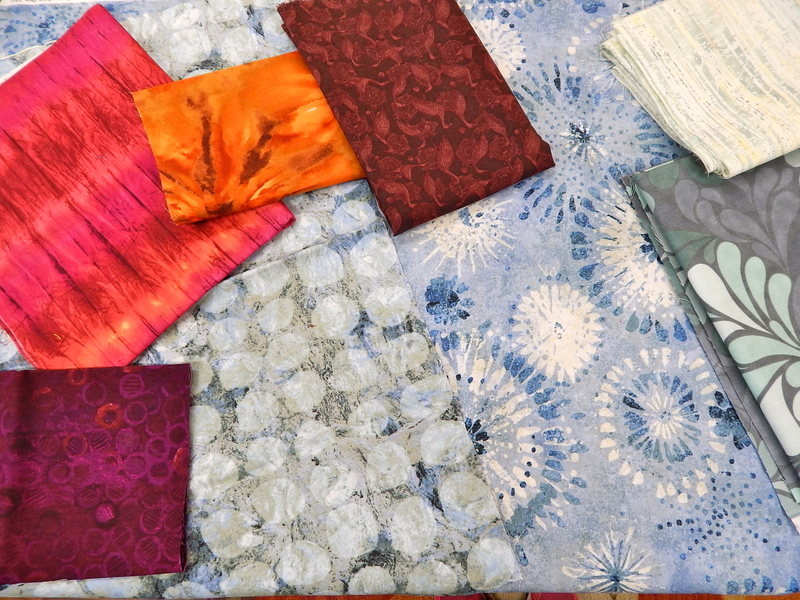 Sometimes those fabrics surprise you, and they do work. But lots of times I am finally forced to eliminate them. 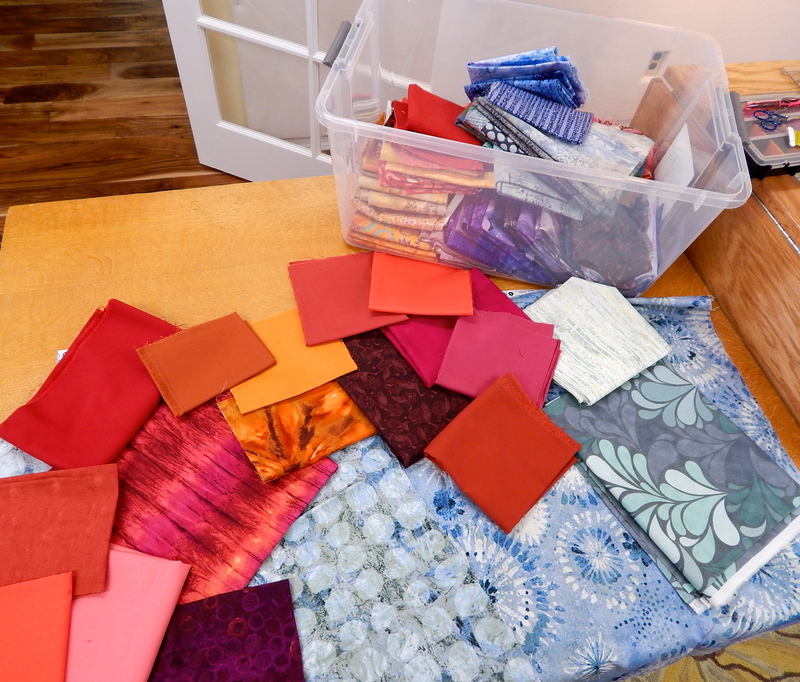 Choosing the fabrics is probably my favorite part of the process. That little white flower/greenish background looks like some I have of the Gallery Fiori/Karen Tusinski. Interesting “pulls”!!! So much fun to keep walking by and arranging/rearranging!!!!!! Stay tuned, hmmmmmm? I have many pieces from that line!! I fell in love with Karen’s orange poppies w/ that green/teal background when I first saw it several years ago. I met Karen last Oct. when DH and I were on the East Coast for a couple of weeks. A very neat gal and uber talented. She has her studio in Rockport, MA. 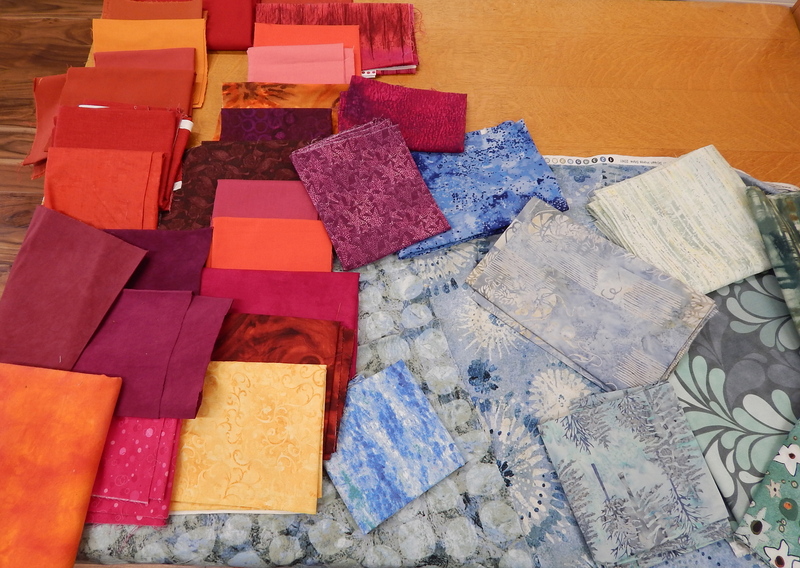 I have all the fabric together,now, to make a quilt….finally…..when I find the time!!!!!!! LOL!